The Mini-Golf group is almost ready for their final showcase! Our three teams made lots of additions and improvements this week. The Blobby Dog and Dragon-Golf teams even joined forces for a group design session that ended up in some great ideas. Check out our progress and stay tuned for the Mini Golf Course in action next week! Matthew and the Volcano team repaired and modified the golf ball elevator and chute system. Ava and Audrey attach and decorate the head of the dragon. Moss attaches more structural supports for the Volcano Team’s creations. Ayana and Keira in the chopsaw room cutting pieces for the next part of their project. Keira and Zane cut sections of the putting green for the Mini Golf course. Conrad and Niam teamed up to make a ladder for Blobby Dog’s house. This way you can putt-putt on a multi-leveled, interactive course! Clay and Bridger experimented with different designs for the golf ball to move from the top level down to the bottom level.. and through Blobby Dog’s head! All three teams came together at the end of the build session to practice their putting skills for the final showcase (with their handmade, custom putters!). More photos and fun can be found on our Flickr page! This week the Volcano Team got their project to a good testing point with the putting green and “castle” attached. Then they figured out a mechanism for catching the golf ball and returning it back to the person putting. Super cool! The Blobby Dog Team made their dog house more safe and structurally sturdy. They even added a second floor to climb onto. Now they can putt on a multi-level course through Blobby Dog’s head! The Dragon Golf team put their thinking caps on to design a creative way to putt the golf ball into the Dragon’s mouth before it flies down the zip line. With all of our teams combined it’s guaranteed to be a mini golf course full of surprises! Ayana uses the jig saw to cut pieces for the base of the volcano. Matthew tests the retrieval mechanism. Owen, Bridger, and Matthew in serious focus mode! Testing time! Esme, Ayana, Nola, Moss, and Matthew test out the Volcano putting green.Success!! Conrad attaches the belly of the dragon with hinges. Ava and Audrey finish cutting the second side of the dragon head… can’t wait to see this dragon fly! It’s hard to believe, but we only have two more weeks of tinkering before our final showcase and epic mini-golf tournament! Check back soon and to see more of this crews’ hard work, be sure to visit us on Flickr! It’s already week 4! We are halfway through our 8 week session and our “Volcano”, “Blobby Dog”, and “Dragon Golf” teams have been working hard and bringing their mini-golf courses to life. The Volcano team got their PVC volcano to stand on its own and they now have a putting green that is ready for testing! Next step: making putters! Blobby Dog team made a head for good ole’ Blobby out of plywood using the jigsaw and also worked on making the dog house stronger. The Dragon Golf team made putters and also made lots of progress on the outside of their flying dragon and ball pit. Matthew uses aluminum wire to attach the PVC frame of the volcano. Zane gets the putting green ready for testing! Keira uses the handsaw to cut more structural supports. Esme uses the jigsaw for one side of Blobby Dog’s head. Niam strengthens up Blobby’s house. Bridger cuts the other half of Blobby’s head! Conrad makes his putter and tests it out. Ava uses a hacksaw (for the first time!) to cut cardboard tubing for her putter. The Dragon Golf team works efficiently together to get the dragon’s body ready to fly! See you next week and be sure to check out more of the fun on our Flickr account! 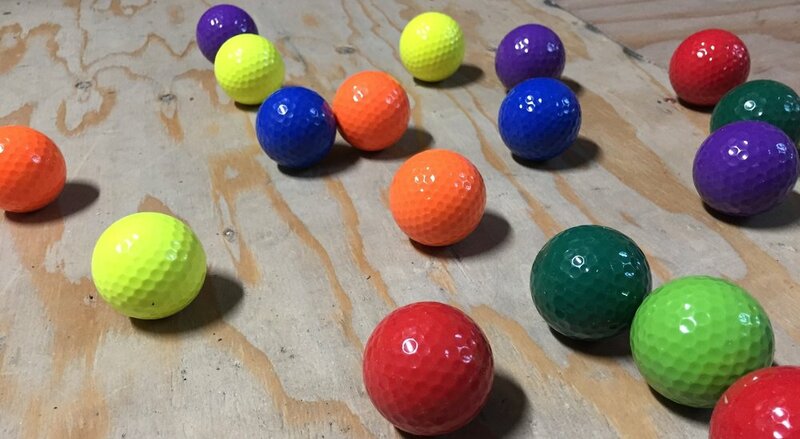 Luckily for the purposes of our tinkering week, our golf balls will generally not be taking flight…other than leaping over small motes, traveling across 80ft ziplines, and launching into the mouth of a dog who’s name is Blobby. Having shared that safety tid-bit, were happy to also share a snapshot of the progress our tinkering crew made this week! In the “Dragon team,” Ava, Audrey, and Conrad finished the main structure of their ball pit and assembled the frame for the body of the dragon. The next step was deciding on what kind of face they wanted their dragon to have! They tried a few – one looked too much like a horse, one looked too mean, and they finally landed on one that everyone was happy with. The team also went on their first adventure to scrap alley (behind the chop saw room) to find pieces of plywood that would work for the sides of the ball pit. They’re looking forward to their next design session to decide how to putt the golf ball into the dragons mouth before it flies down the zip line! The “Blobby Dog” team is going big!!! But with big structures also comes the need for structural supports to match. Clay, Niam, and Bridger all worked hard this week on making “Blobby Dog’s” house a little less wobbly. The pieces came together fast this week for the “Volcano” team. With side rails cut and assembled, now they have a putting green that is ready for golfing! They also had a chance to work with new materials and new tools like the jigsaw and hacksaw. Ayana practices with the jig saw. Great two handed form! Keira learned how to set a guide to measure the length of 2x3” she wants to cut. Instead of using a standard tape measure for every cut, she can slide the measuring guide across its track to set the correct distance. The Volcano team also had a blast cutting and bending PVC pipe to begin creating the frame of the mighty volcano! Mathew super focused on his cut. Keira, Zane, and Ayana use their collective strength to bend PVC pipe into the shape of a volcano. Another great week in Tinkering Mini Golf World! Check back soon to see how this epic course takes shape! Want to see more photos? Check out our Flickr page! Happy 2019, everyone! We are back from Winter Break and ready to start up Tinkering again. This session we have many new faces and a few familiar ones, too. We are already two weeks in and have made lots of progress on our fun and silly group project- a MINI GOLF COURSE! 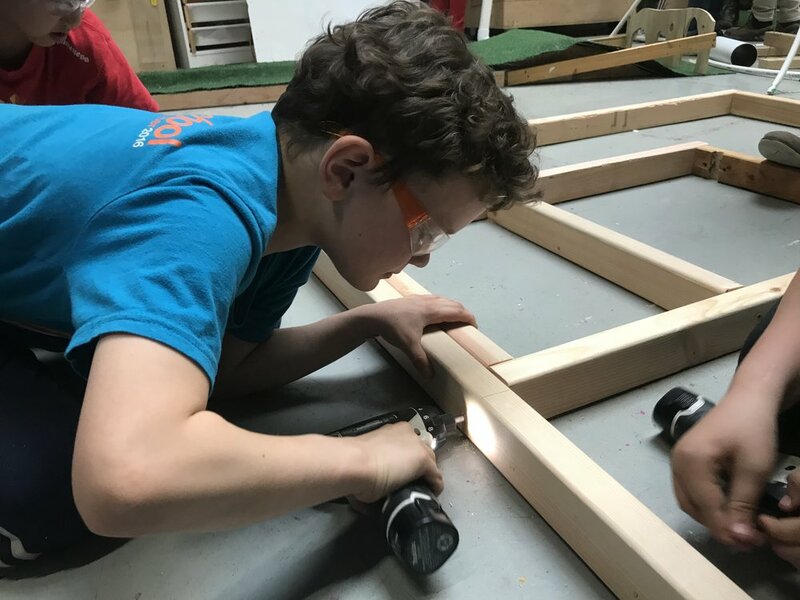 During our first session, our returning tinkerers got a refresher on tool safety and our newcomers learned how to use the chop saw, drills, and clamps. We ended the day with a design session to get our creativity and big ideas flowing. By our second session we were all ready to jump straight into building. The innovation and collaboration is at full force- check out some of our big ideas in the making! Thinking caps are on and our design sessions are underway! Tool safety training! Matthew masters his skills on the chopsaw. The Volcano group makes a successful bridge out of clamps, and Esme and Nola collaborate while using the drills. Esme on the the chopsaw. Niam and Conrad use clamps and squares to make a sturdy frame. Audrey and Ava in serious build mode! To the left: Zane and Keira measure and cut the putting green. To our right the Volcano group come together to cut a huge piece of plywood on the bandsaw. For more photos of all the action, please visit our Flickr page!